This counter-model High Capacity Counter top Slush freezer is designed for high quality and speed. 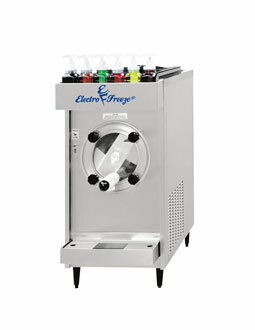 High quality, fast, easy, portion-controlled, labor-saving slush and smoothies: run a neutral or core flavor and increase your flavor options with the 6 syrup bottles provided in the rack. Perfect for country clubs, pools, festival booths and medium size hot dog and hamburger stands that have counter space available to add fun and profitable menu items.